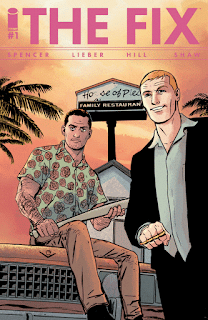 The Fellowship was fortunate enough to obtain a copy of THE FIX #1 from Image Comics. Nick Spencer writes, Steve Lieber draws, Ryan Hill colors, and Nic J. Shaw letters. As a kid, Roy had an unhealthy affinity for the bad guys on TV and in the movies. And unsurprisingly, this gave him the idea to become a cop. Now he and his partner Mac are neck deep in it, way past their eyeballs in gambling debt, and they owe the local crime boss (a stay-at-home dad) a bunch of money. His solution: they’re going to smuggle a package through the airport, past Pretzels. The premise is crazy, but the way Roy describes it, it kind of makes sense. And that’s enough to get the ball rolling on this wild, woolly, fast-talking, scary adventure of a story. It’s built as organized chaos, with misdirection and weird characters galore. And it all just works, in its own way. The art is just the opposite, though, with a great sense of realism to give just enough reminder that there’s some kind of order to it. Pick your favorite cop show, juice up the main characters on crank and X, and give them a list of laws to break over the weekend. That might get you close to the delightful madness that is this book. Check this one out. 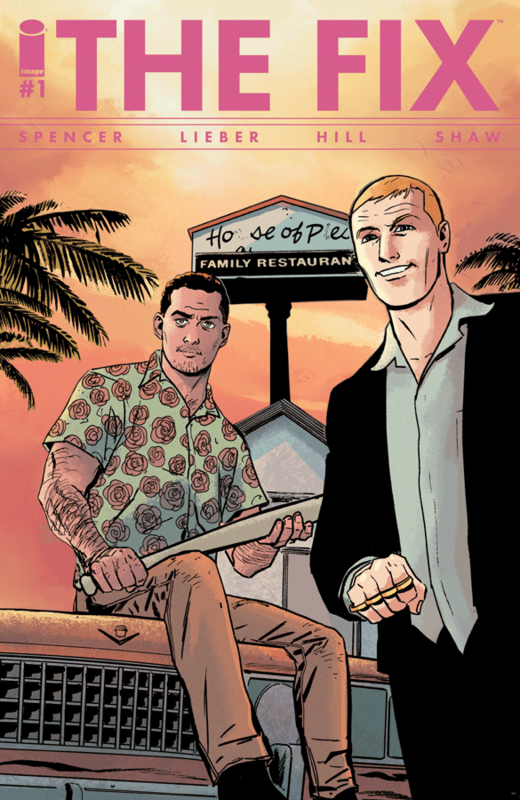 THE FIX #1 is available now at your FLCS or at imagecomics.com.